Four Fabulous Freebie Fridays: Week 4 - Benjibox Shoe Organiser Giveaway! Well we come to the fourth and final week of Four Fabulous Freebie Fridays (even though I might be one day late! ), I hope that you have all enjoyed the giveaways and congratulations to the winners so far!! What better way to whet your appetite for a bit of wardrobe organising and fashion, than with a set of 10 fabulous shoe organisers from Benjibox?! I have a set of 10 Shoe boxes up for grabs for one very lucky winner (valued at $99.50). 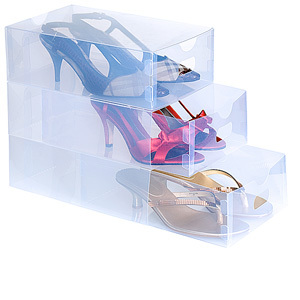 If you are a bit of a shoe fan (I don't know too many females that aren't) then you are going to love these clear and stackable shoe organisers for your prized collection. I will be showing these in action very soon on the blog but you can check out the product and receive more information over on the Benjibox website. Utterly Organised in conjunction with Benjibox are giving one lucky reader the chance to win a set of 10 shoe organisers valued at $99.50. I love any style of shoe, but comfortable mid-heel and black would be my favourite as it is so versatile. I usually go for a sensible shoe, but I do love some knee high boots as well! These boxes would be fantastic to organise my shoe collection, I believe that I have a shoe for all occasions but they are all so messy that it is hard to see what I actually have. I love all kinds of high heels, they make every outfit fantastic!! Also I am short, so they help with that too. I love peep toe shoes with medium-high heels. I'm short so need all the height help I can get, but with a small bub I have to wear sensible shoes. I've heard lots of rave reviews of these benji boxes. Would love the chance to check them out for myself. My favourite style of shoe is my 'internet shopping style'. Wow I've never brought shoes over the net, but now I have there is no turning back! This particular style was hot pink, high heel sandal. Perfect for work, and fun this summer! I'll need these boxes as I'm thinking my shoe collection may double in the coming months thanks to the humble world wide web!! I love pink shoes! I'm not sure why I have a fascination with them but I do... fluro pink runners, hot pink heels, pale pink flats - you name it, I've got it... in pink :) And it would be great to easily view what's in my wardrobe with these great boxes!! My fb name is Joyce Tan, in case you need to verify entry. Since my transition from the corporate world to the world of motherhood I like flat, black shoes that I can slip on and flick off quickly. Thongs. Comfy and easy to take off when shopping! I love the high wedges..... so so so comfy and give me some height! I live in ballet flats and thongs and own way too many different styles and colours. At the moment they are all thrown together in a basket, but I would love to have them organised in lovely Benjiboxes! I used to love love love heals, but with two kids, my fav pair of shoes (AC - after children) has to be dressy thongs/sandles, they can be worn casual or with a dress, and can be thrown on in an instant! The benjiboxes look awesome, and would be great to keep the dust out and my hayfever at bay. :) What a fabulous invention. Thanks for sharing & the chance to win some to start the collection! For everyday wear I love sneakers, but sandals can be dressed up or down, so I often wear those out - especially in summer. Ballerina flats is my favourite style of shoe. Love to wear them with colour denim. I adore peep toe. They're so cute and complementary to feet. Flats are my favourite style. I'm on the taller side so anything with too much of a heel leaves me looking over the top of people or having to lean down to hear a conversation! I love ballet flats. They're comfy and easy to wear for long treks into uni but I can get them in all sorts of cute colours and styles to go with my outfits! I am a bit of a thong girl myself (foot thongs that is lol). Can easily slip them on they are comfy, and there are some great styles available these days, far from the old double plugger days. If I did have to choose something else I would pick wedges, for me they are a good compromise on heels, which I am terrible at wearing, but sometimes need some extra height. I have to say it's heels all the way for me!! Medium - not too high - as much as I'd love the super high spunky heels I am already tall so mid height is best for me! Any style - bright, patterns, solids, classic black! Would love to have those nice shoe box to keep the shoes clean & tidy. I have a huge shoe fetish and have to buy new shoes every week. Favourite style is paltform with high heels. I love TUK brand as nothing says "look at my shoes" like having a pair that stand out in a crowd. Love ballet flats...easy to wear, everyday styles and fashion colours! Since being a mum, my head and heart opt for comfort. Flat shoes are my best friend. Oooooh and wedges! Being nearly six feet tall, l love FLATS of all types, but especially my TOMS canvas shoes... Comfy, a little different and supporting a good cause too. I love shoes and at the moment it's all about colour. Wedges are the comfy higher options and you just can't go past the ever versatile ballet flat. As a mum I just LOVE my ballet flats that can be quickley put on and still look very stylish. I also love my very comfortable ILA goggers for when I'm on the go. I love ballet flats... they're comfy, yet more stylish than runners. Mine would have to be ballet flats! I live in them all the time. Anything easy to walk in is preferable. Top Tips for a Tip Top Closet!